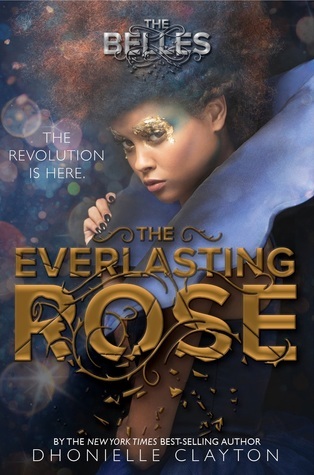 I requested a digital galley of The Everlasting Rose by Dhonielle Clayton from NetGalley and Disney Hyperion publishing. If memory serves, I received my ebook on release day, which was very exciting! I had high hopes for Rose after the amazing world building in The Belles, and I am pleased to report that this is not a case of 2nd book syndrome. For me, the 2nd book far exceeds its predecessor. Camille was one of my favorite new characters last year. I loved reading about her fantastical skills, and her world but she lacked a lot of agency in the first book due to her position in court. It wasn’t her fault, and I don’t think it was a product of bad writing, but it was a struggle for me to watch this amazing character tossed around like a rag doll. That idea is expanded upon in book 2 in ways I hadn’t previously considered, but I’ll get to that in a bit. In Rose, Camille and her sister Belles have to find a way to stop the tyrannical rule of princess Sophia. She is downright terrifying, and honestly has no redeemable qualities. In order to overthrow Sophia, Camille needs to avoid her prying eyes which seem to be everywhere. It proves to be quite a difficult task as Sophia becomes a more and more omnipresent force of evil. The truly great thing about Rose is that Camille gets to make so many choices for herself. She frequently shuts other people down and tells them the best way to solve a problem. It’s clear that her previous lack of agency existed out of necessity and survival. This girl is no pushover. When she runs into a problem, she solves it with beauty and style. This book dives into some pretty dark territory. Human trafficking is the primary social issue that comes into focus in Rose. There are hints of it in The Belles, but it comes across with much more clarity and focus this time around. It never feels ham-fisted or overbearing and I loved how the author seamlessly worked this timely issue into the book. In this world where beauty is king there are also a lot of questions about what makes a person beautiful, how much value beauty has, and how to find inner beauty. In The Belles I frequently felt conflicted as to whether or not I should enjoy the flowery and lovely descriptions of the bodies, hair, and clothing around Camille. In The Everlasting Rose though, there is a new group of characters introduced that make it clear that beauty isn’t everything. I loved having that voice added to the story, and I think it provided much more depth to the world. Ultimately, I think my misgivings with the book center around the fact that no character can hold a candle to Camille. Sophia is her polar opposite, and honestly just watching the two of them duke it out on an even playing field would be fascinating. However, there are many other characters in the book and I found it difficult to care for them the same way I did with Camille. I’m excited to see what Dhonielle Clayton will write next! I’m definitely here for more magical worlds from her. The magic system she created is like nothing I’ve ever read, it was hard to say goodbye to the world she built! I definitely recommend this series to anyone who likes courtly drama with a healthy dose of magic and social commentary. Let me know if you’ve read The Everlasting Rose!